One of the best ways to protect long gun and rifle evidence is by storing it in a new Long Gun Box. Keeping this valuable evidence in a new Long Gun Box ensures that there is no suggestion of cross contamination from another previous long gun. 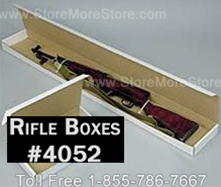 When storing rifle and long gun evidence in Long Gun Boxes on shelves or in cabinets, it is easier and more efficient because of the standardized size of the boxes. In addition, the exterior of the Long Gun Box has plenty of room for all the relevant identifying labels and handling instructions. StoreMoreStore offers Long Gun Boxes at great prices so that you can be sure to always have a new box ready for this essential evidence. If long guns have been used in a crime, they can offer a wealth of DNA related evidence. The shiny metal and smooth surfaces of the stock may have latent fingerprints that can be processed. And if the stock is checkered, it may contain epithelial cells (also known as contact DNA) from the shooter. The ammunition may also contain latent prints or epithelial cells. Finally, there is a possibility that entire long gun was exposed to body fluids. Once the determination has been made that the long gun contains evidence that will be examined forensically, it should be handled and protected with great care. Please visit our online store if you are interested in Long Gun Boxes for your law enforcement agency. 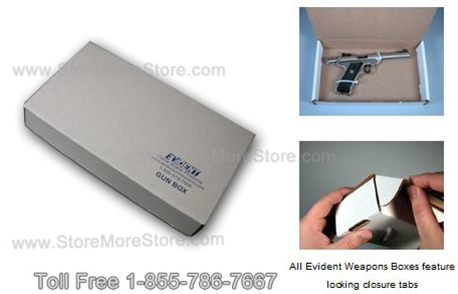 And in addition to Long Gun Boxes, we also have Handgun Boxes available at great prices! Also, if you have any questions or need help with a product, feel free to give us a call at 1-855-786-7667 to speak with a representative that can help.